It is possible to combine multiple types of the composite materials* we manufacture. We call these products "composite metal materials." *Composite metal materials are materials like those below that are composed of a single metal with additional functions. • Plating — Materials treated with plating such as Au, Ag, Ni, Sn, and Sn reflow. 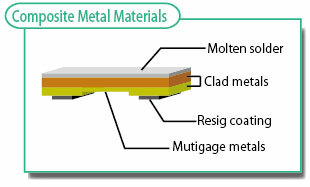 These kinds of composite metal materials are often used in resistor materials (clad metal + molten solder plating + OVIONE™ Coat + multigage metals) and connector materials (OVIONE™ Coat + tin plating). Recently we have been receiving more and more requests from electronic components manufacturers and other firms for materials like these that combine technological elements. Many companies are seeking to differentiate themselves technologically from their competitors. Example combinations are shown in the chart below. At the time we ship materials, they have already had functions added in downstream processes, which allows you to reduce the number of process after parts have been processed. We add downstream processes to the material stage, which so that you no longer have to outsource them. This allows you to reduce outsourcing costs and the hassle of managing subcontractors, and ultimately helps to reduce total costs. 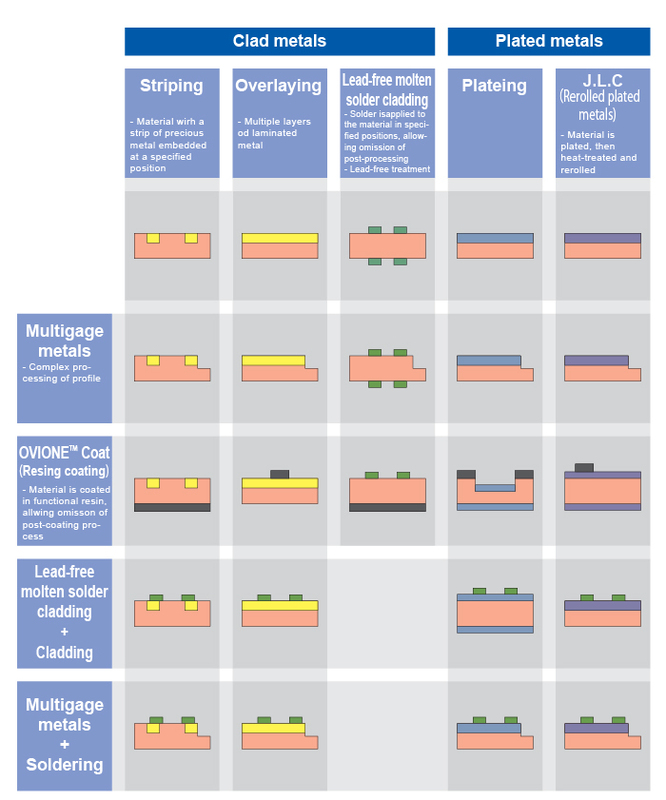 Since strips are processed (given additional functions) at the material production stage, it is possible to make uniform parts with little variation. Adding shapes and functions that have not been possible to achieve in downstream processes up until now enables you to differentiate your company from your competitors.